Remember that cold, intolerable winter weather that keeps you glued next to the fireplace and makes your indoor plants look dull and wilted? The wilting and dull color of the plants is as a result of dry air that you can fix by introducing a humidifier into the room. Humidifiers are devices that add moisture or humidity into the air and help to conserve plant moisture, thus lowering the rate of evapotranspiration in plants. Plant humidifiers are in high demand during the winter, and because there are so many on the market, it can be difficult to choose the best. 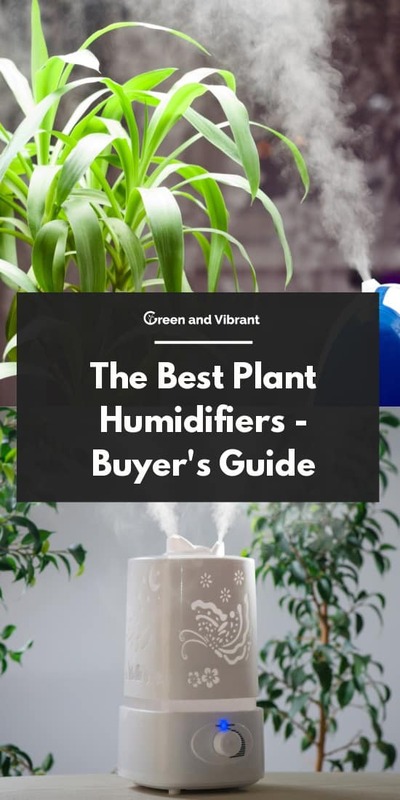 This article will help shed some light on which are the best humidifiers to buy for your houseplants. To choose the product that best suits your indoor plants, it is important to consider a few things. Most plants require a humidity level of 60% or more. Desert plants, such as cacti, require at least 40% humidity. If your houseplants are in your living space, 50 to 60 % humidity is ideal. For a 300 square foot room, you will need a small humidifier. For 399-499 square feet, you’ll want a medium sized humidifier, and for a room larger than 500 square feet, choose a large humidifier. Using the appropriate size of humidifier will help you avoid too much humidity in a small room and too low humidity in a larger room. As much as you need to supply a good amount of humidity to your plants, it is not advisable to place the humidifier too close to the plants or facing the plants. This is because humidifiers use fans that rotate to release moisture. Placing the humidifier too close to the plants might cause draught, which leads to wilting plants. You also need to decide if you are up to the tasks that accompany owning a humidifier. It needs to be cleaned regularly to avoid the buildup of bacteria. Filters also need to be changed for hygiene purposes. If you do not want to maintain it, don’t buy a humidifier. Some humidifiers are noisy while working because of the fans that rotate to produce moisture. If you can tolerate the white noise of a fan, you won’t mind a humidifier. Timers, bells, and whistles are also part of the bargain because you will need a reminder to refill water, adjust humidity, or turn off the humidifier. In addition to the above, you will need to consider the type of humidifier that you prefer. There are humidifiers that add warm moisture and those that add cold moisture. The wrong level of humidity can be harmful to your plants. Low humidity levels encourage the spread of viruses and bacteria, leading to disease infestations on the plants. Low humidity means that the plant water will dry out more quickly. This leads to drooping plants and dulling and tipping leaves. High humidity will cause your room to become damp, and this encourages bacterial growth, which leads to diseases, mold buildup, and dust mite attacks. All humidifiers serve the one purpose of increasing the humidity in a room. Therefore, they all contain a water reservoir. The humidifiers noises while in activity range from low hums to ultra-quiet, the MistAire being the low humming, while the Vicks Warm Mist has a whispering but quiet operation, and the Honeywell, TaoTronics and the PureGuardian humidifiers are in the middle. The Honeywell and the TaoTronics humidifiers have filters to get rid of minerals from the water while the MistAire, Vicks Warm Mist, and the PureGuardian humidifiers have no filters. The PureGuardian Humidifier lacks a handle, which makes it difficult to carry compared to the rest. When the water level is low, the MistAire, Pure Guardian, TaoTronics, and Vicks Warm Mist humidifiers automatically shut off. You have to check the Honeywell humidifier to determine the water level. This 9.55 pound, 13’’ high Honeywell HCM350W Germ-Free Cool Mist Humidifier is an effective humidifier that supplies soothing, invisible moisture to relieve the discomforts of dry air. Its users love it for its ability to maintain water for 24 hours per filling and because it is quiet. You can therefore comfortably put indoor plants in your bedroom and still get a good night’s sleep. It has a 3-speed setting to adjust moisture output and the sound level. It also contains a wicking filter that absorbs any minerals from the water and prevents them from being released into the air and contaminating it with white dust. It is important to note that if you want to replace the filter, you have to use the filter model HAC504 because it is treated with Protec antimicrobial that inhibits complete mold growth. This maintains the durability of the humidifier. The general user verdict concerning the Honeywell HCM350W Germ-Free Cool Mist Humidifier is that the description of the humidifier is precise. One user conducted a study on two other humidifiers, and his results were that the humidifiers were difficult to clean and they could not record any humidity increase using a hygrometer. However, a test on the Honeywell humidifier proved that it is easy to clean and, in 24 hours, the hygrometer had recorded a 12-degree increase in humidity in 24 hours. The user also observed smoother and greener plant leaves after purchasing the humidifier. The Honeywell humidifier is very quiet. You can, therefore, put it next to your bed if you have houseplants in your bedroom and set it on high speed. While running, its fan produces a white noise that enables you to sleep more soundly. The Honeywell humidifier lacks an automatic shut-off control. This can be inconvenient as you have to monitor it to ensure that it does not exceed your preferable humidity level. The TaoTronics Cool Mist Humidifier is a 3.5-pound humidifier with an LED display that shows you the amount of moisture in a room. It also contains a micro cartridge that filters water before converting it to moisture to remove all microorganisms, releasing odorless, pure air. It is ultra-silent because it uses ultrasounds, which you can barely hear and therefore the humidifier allows you to sleep throughout the night without any noise. This humidifier has a capacity of 4 liters and can supply moisture to a room of 500 square feet for 15 hours. You can adjust the amount of mist in the room using a 360-degree rotatable nozzle. The timer sets the humidity level for 1 to 24 hours. When the water level gets low, it shuts down automatically. One user said this model costs half the money he spent on previous humidifiers that ended up being disappointing. Another user was happy about keeping the humidifier at the bedside and sleeping comfortably without any noise from the humidifier. Though some users have complained about having to refill the water every 2 to 3 days and that it is difficult and time-consuming to clean the humidifier, this did not prevent them from recommending the product. The humidifier does not leave any white dust. The multi-directional mist discharge allows for proper supply of moisture in a room. The positioning of the tank makes it difficult to remove it to refill the water. The cleaning of the humidifier is difficult, and can, therefore, pose a high risk of bacteria build-up that can lead to plant diseases. The Vicks Warm Humidifier with Auto Shut-Off is a germ-free humidifier that releases heated vapor that kills bacteria, mold, and fungus spores. This 4.25 pound 14.2 ‘’ high humidifier fascinates users because inhalants, specifically Kaz, can be added to the water to offer relief to coughs and cold. It is easy to use because it includes handles that allow you to remove the tank easily and fill it with water. The tank, when filled with water, can run up to 12 hours. You can manage the humidity using an adjustable knob with multipurpose settings. Once the humidity is high enough, the humidifier automatically shuts down. It does not contain a filter. If you are looking to purchase the humidifier requiring the least maintenance, then the Vicks Warm Mist Humidifier is an option. The Vicks Warm Mist Humidifier has gained strong, positive feedback. One user appreciated the honest and extensive description of the product and loved how easy it was to clean by simply wiping out any visible clogs or dirt using vinegar. 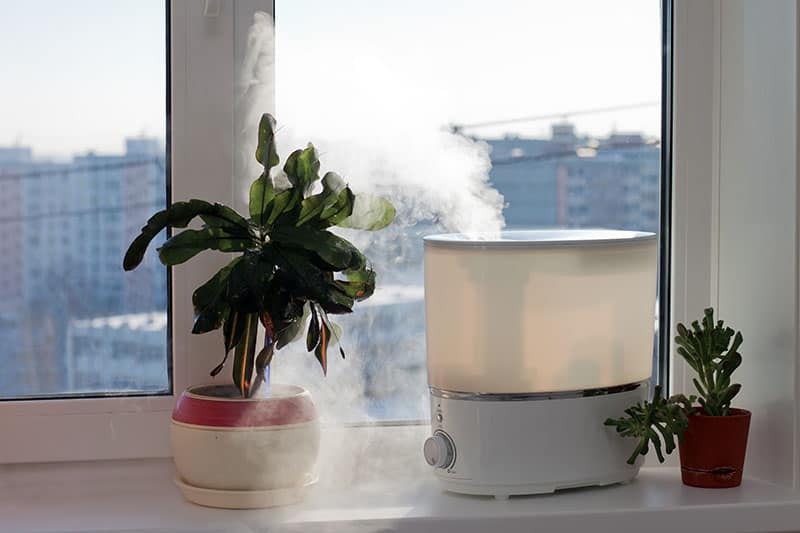 Another user observed that having the humidifier in the bedroom, apart from improving the quality of the houseplants, helped her recover from coughing, sneezing, and nasal congestion. Though the humidifier is quite noisy and bulky, users have not seen that as a downside. If you’re looking for a low maintenance humidifier with a friendly price and no compromise on quality and performance, then the Vicks Warm Mist Humidifier is a great option. The humidifier kills bacteria and warms the room with hot vapor. No extra costs of having to buy a replacement filter. Humidifiers with filters always need to have them replaced after some time. The Vicks Warm Mist Humidifier saves on the replacement cost. You need to use distilled or demineralize water because this model doesn’t contain a filter. The humidifier is also a little too big for a small room and can make storing it difficult for some people. 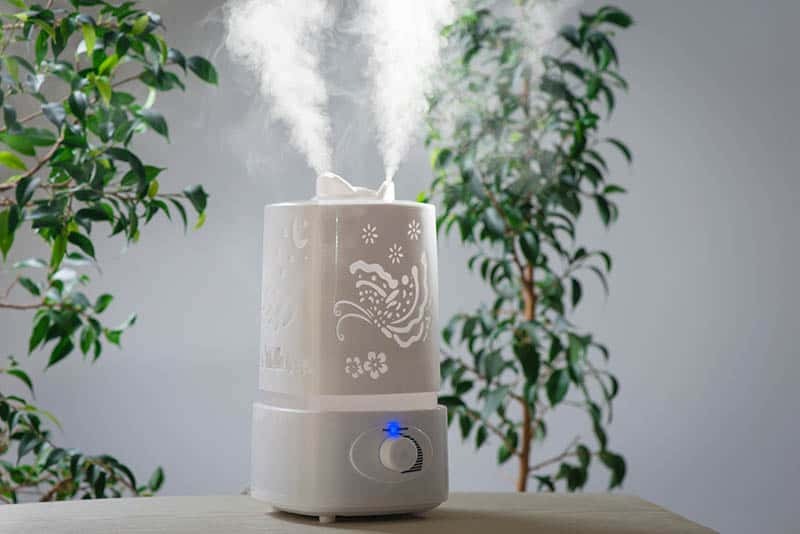 The Pure Guardian Ultrasonic Cool Mist Humidifier is a 2.3 pound, 13.2” high humidifier that has a tabletop design, making it ideal for medium-sized rooms, such as offices, nurseries, or bedrooms. It can add moisture to the air for 15 to 70 hours, depending on the settings of speed and the atmospheric conditions. Users love this humidifier because it is ultra-quiet due to the ultrasonic technology, whereby mist is produced using a metal diaphragm that vibrates at a high frequency and therefore contains no fan. The humidifier has a silver clean protection surface that prevents the accumulation of dirt or minerals, therefore inhibiting the growth of mold in the tank. This humidifier automatically shuts off when empty. It has no filter and therefore does not require much care or maintenance. All users of this humidifier agree that the pure Guardian Ultrasonic Cool Mist Humidifier can hold a lot of water, so you do not need to refill it very often. One user tested the amount of humidity released by the humidifier at the lowest setting and discovered that this humidifier has no level of insufficient humidity. Even at its lowest setting, the humidity released is still the required amount. Users also consider the humidifier easy to refill as you only need to put it in the tub and add tap water. Some users complained that it was difficult to handle, though, especially when carrying it because it has no handles and it could slip and fall. This was not a large issue to them, though, and it did not prevent them from buying the humidifier. It has a low water indicator light that alerts you when it is time to refill the tank. It saves on the cost of replacement filters since it does not have a filter. The humidifier produces white dust, which is a residue of minerals present in water, especially tap water, which are left when water evaporates. When white dust accumulates on leaves, it can disrupt the leaf activities, such as respiration and photosynthesis. It lacks handles and could easily be damaged if accidentally dropped while cleaning or refilling the water tank. The MistAire XL Ultrasonic Cool Mist Humidifier is a 36 pound, 12’’ high humidifier that can produce moisture for 10 to 12 hours of continuous operation. It has a large tank with a capacity of 1 gallon of water and can, therefore, provide moisture to a room of over 500 square feet. Users like it because it has two nozzles that aid in the customization of mist flow and it also contains a mist knob that allows the regulation of mist in a room. The humidifier operates silently with a little amount of white noise so you can put it in an office with houseplants. When the water level is low, the humidifier automatically shuts down. Therefore, you have to check the level of water and refill it accordingly. The MistAire XL Ultrasonic Cool Mist Humidifier has no filter, and it is a good option if you are looking for something inexpensive. Users have appreciated the honesty of the product description. Users have noted that the MistAire XL Ultrasonic Cool Mist Humidifier comes with a cleaning brush. One user researched the efficiency of the humidifier compared to the rest and concluded that the MistAire has options on how to produce mist, either in spray form or the unidirectional form, due to the presence of mist nozzles. The night light variety of colors also makes the humidifier an outstanding choice for bedroom plants. It’s simple to use as it only requires adjusting the mist knob to attain the humidity level of your choice. It produces white dust, which is harmful to plants. Avoid using tap water as it contains many minerals. Use distilled or demineralized water. Humidifiers have so many benefits, not only to the plants but also to your surroundings. Humidifiers reduce infections in the house. The causal agents of diseases, including bacteria and viruses, do not survive in humid conditions. In case a plant is scarred or has a fungal disease, a sufficiently humid room can hasten the recovery of the plant. 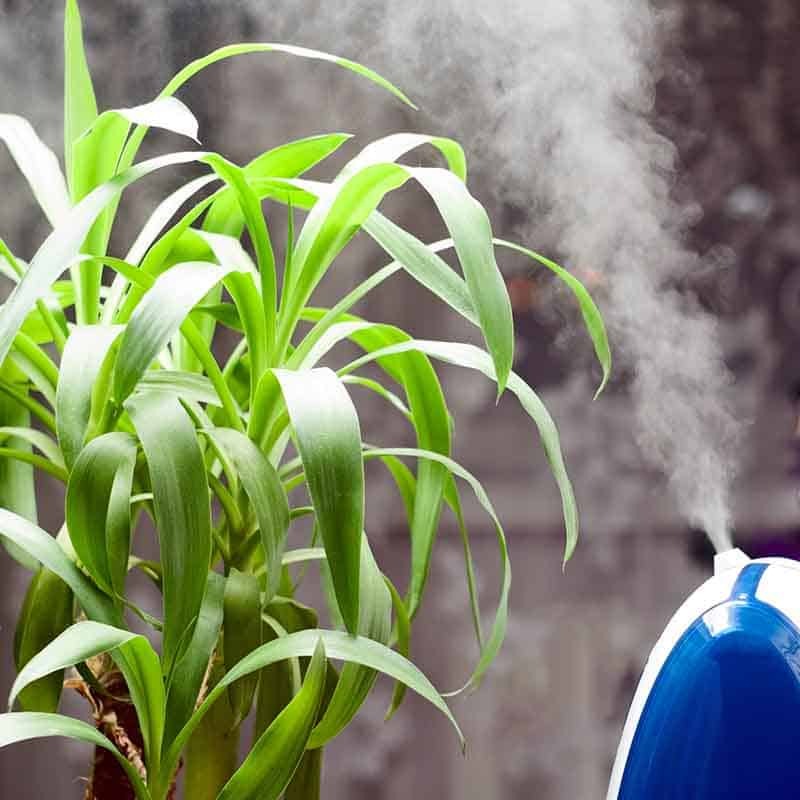 Humidifiers aid greatly in healing the plant leaves and making them smooth and vibrant. The availability of moisture gets rid of the dryness, dullness, and tipping of the leaves. Vibrant leaves lead to healthy plants because leaves manufacture food for the whole plant and they require moisture to do so. Plants require warmth for healthy growth. Moist air is always warmer than dry air. With the humidifier turned on, it increases the warmth in a room, meaning that you will not need to use the heater to create warmth for your indoor plants. This helps in saving money on utility bills by using the humidifier to heat the room a little and supply humidity simultaneously. Low humidity in plants discolors flower buds and makes them fall off the plant. Dry air makes flower buds look brown. When they fall off, that means that the reproduction of plants will not occur and this is crucial for species survival. Raising the humidity in the indoor garden will ensure that the buds bloom into flowers and reproduce. There are different types of humidifiers. They can be warm mist humidifiers or cold mist humidifiers. As much as they all serve the same purpose, certain characteristics make them unique. Cool mist humidifiers are usually more affordable than warm mist humidifiers. They contain fans that rotate to release moisture, making them a little noisy. They require more cleaning, and for these humidifiers, the rate of humidity is inversely proportional to evaporation, meaning that the higher the humidity, the lower the rate of evaporation. Warm mist humidifiers are more costly in general, and they require a lot of cleaning. But there is no limit to the amount of humidity that you can add while using warm mist humidifiers. They ensure that the moisture in the room is always constant in such a way that the more evaporation increases, the more the humidifier releases moisture. There are certain precautions that you should take while using your humidifier. Proper handling enhances the performance of the humidifier and makes it more durable. The first precaution is determining what type of water to use. We never recommend using tap water. Use distilled or demineralized water. Rainwater contains so many minerals that when released into the air, it forms a residue known as white dust once the water has evaporated. These minerals also cling to the bottom of the water tank, and if not cleaned properly, can cause the buildup of bacteria. Distilled and demineralized water contain fewer minerals. You should clean the humidifier at least once per week. This helps clear the water tank of any minerals or dirt that might have accumulated in it to prevent bacterial buildup. Clean the tank with bleach and rinse it thoroughly. If your humidifier has a filter, ensure that you replace it regularly for hygienic purposes. Ensure that you have a hygrometer in the room to measure the amount of moisture available. It should not be extreme. If the humidity is low, adjust the humidifier to increase its output, and if it is high, reduce the humidity level. However good a product is, it must have its disadvantages. The disadvantages of a humidifier will also help you to decide whether you want it or not. The first disadvantage of a humidifier is that it can provide a growth medium for bacteria and fungus if not cleaned properly. The bacteria are then released into the air by the humidifier, and when they land on plants, they cause diseases. Another disadvantage of a humidifier is that it adds more chores to the house. A humidifier helps provide the moisture that you and your plants need. You must, therefore, devote yourself to faithfully cleaning the humidifier for it to provide clean air. Completely scrub the areas where there are hard water deposits, and if the tank has any stagnant water, empty it and clean it thoroughly. Noise is another disadvantage of humidifiers. When the fans are rotating to emit moisture, there is a certain level of white noise that the humidifier produces. It can be annoying until you get used to it. The production of excess moisture is an unavoidable disadvantage especially when your humidifier is not self-regulated. High humidity provides a conducive environment for spore germination and successful infection. The recommended humidity for indoor plants should not exceed 60 percent. If you do not have a humidistat, you can observe your surroundings to know when to regulate moisture. If you observe either moisture collecting on the insides of your windows, mold growing anywhere in the house or damp tiles or floor, the humidity level is too high. The collection of white dust around the house is also a disadvantage of the humidifier. In case the only available water you can use has minerals, the humidifier will deposit them as a residue, both in the water tank and around the house. When white dust collects on the leaves, it blocks the plant pores that the plant uses for photosynthesis and breathing. This wilts the plants as they are not able to make their own food, and prolonged white dust accumulation can dry your plants. We, therefore, recommend cleaning the plant leaves regularly. You can clean them by spraying the plants with lukewarm water. Too hot or too cold water can injure the plants. If the dust accumulation is too much, coat the plants with soapy water and then use clean water to rinse them off. There are many mistakes that you can make while using your humidifier that can be harmful to you, your plants, or to your humidifier. It is important to be aware of these common mistakes so that you can be safe and ensure the durability of your humidifier. Ignoring the humidity levels is a common mistake that you should avoid. Moist tiles and condensation on windows are indicate high humidity levels. Once you make this observation, it is advisable to adjust your humidifier to lower the humidity level. This helps avoid the occurrence of diseases caused by bacteria transmitted through high humidity. Excess humidity in plants can also lead to the bursting of the plant cell, leading to the wilting and dying of plants. Dull, wilting leaves and discolored flower buds are signs of low humidity. Increase the humidity level when you see any of the above. Neglecting to clean the humidifier is another mistake. As stated above, the humidifier adds moisture to the air that you and your plants breathe. It can also add other things if your humidifier is left to build up minerals or bacteria. It’s therefore important to clean the humidifier regularly to avoid bacteria buildup in the tank. Do not leave the humidifier with water in it when you’re not using it. If the water sits too long, it can form a film on the water and lead to the growth of bacteria, or worse, algae. When you empty the tank, wipe it with bleach or hydrogen peroxide to inhibit bacterial growth. Using tap water for your humidifier is discouraged. The minerals in the tap water form a residue known as white dust which can block the plant pores, leading to poor plant growth. Use distilled water or demineralized water. Based on the descriptions of the humidifiers above, it is beyond doubt that the Honeywell humidifier is my top pick for the next winter season. Beside having a great premium build, it has all the characteristics of other humidifiers. The downside is that there is a bit price leap between it and the rest. So if you are price-sensitive, we would recommend the TaoTronics humidifier. This has all the necessary specifications of a great humidifier, but is more advanced and contains some additional features that increase its efficiency. For instance, the presence of the cartridge water purifier that produces very pure and odorless moisture, the timer, which enables you to input your humidity preference ahead of time, and the 360-degree adjustable nozzle for mist control has made the TaoTronics Humidifier our top choice and the most highly recommended humidifier by users.